Researchers have designed coiled metasurfaces that not only completely absorb low frequency sounds, but are a tiny fraction of the size of traditional sound-absorbing systems (Credit: Assouar/CNRS). Absorbing low frequency sound is a big job, or at least, a job for big things. Acoustic absorption systems require big resonant cavities with large amounts of heavy damping material and significant surface areas to work efficiently. Consequently, the sound-deadening systems used in music studios and anechoic chambers take up a lot of room. Now scientists have flipped this notion on its head by designing coiled metasurfaces that not only completely absorb low frequency sounds, but are a tiny fraction of the size of traditional sound-absorbing systems. 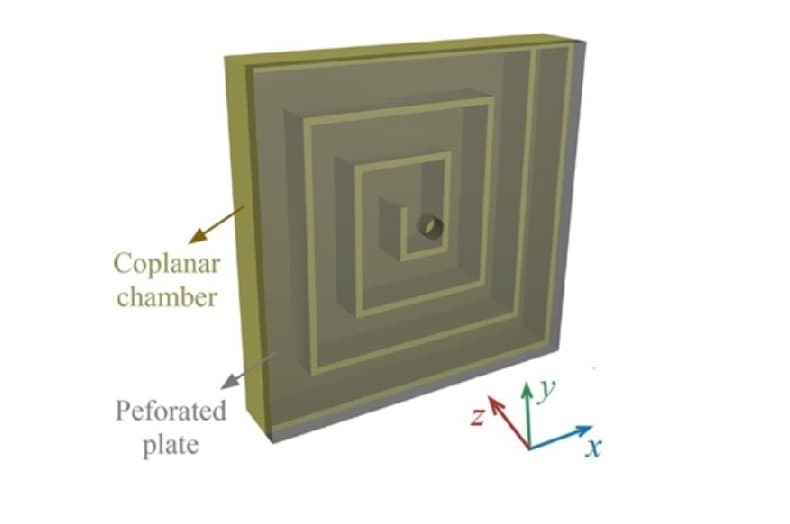 Many standard resonant acoustic absorption systems work by deadening sound energy using an inner diaphragm behind a perforated plate that effectively reduces the wave energy on the way in, then funnels it into a resonant frequency chamber where it is allowed to dissipate. The wavelength of sound at low frequencies – around 200 Hertz and below – however, is in the order of meters in size, so traditional acoustic absorbers need to be physically large to resonate and cushion noise at those frequencies.